In this workshop, students explore the Holocaust by creating poetry and drawings. Through our art we will acknowledge individuals who survived or perished, while restoring their identity and giving form to their lives. How and why did the Nazis gain power in Germany? When did the Holocaust start? In this workshop we will learn about propaganda, ghettos, and the path to genocide. If you have ever thought to yourself, “I’m only one person, I can’t do much about the world’s problems,” then this workshop is for you! Using the “Beyond Duty” exhibit of Righteous Among the Nations, we will explore how all of us may have more power—and more opportunities to do good—than we realize. The Darfur Genocide and the decades long civil war in Sudan flooded the country and its neighbors with refugees. This workshop explores how genocide creates refugees and how the world responds to humanitarian crises. Discover the voices of teenage diarists as they describe the invasion of their homelands, the rise of Nazism, and their experiences in the ghettos. What do we share with them and how do we guard their memory? How does the ideology of a nation impact citizenship? We will trace the geographical dis-location of 110,000 – 120,000 Japanese Americans from city centers to the margins during World War II, through the history of a San Francisco school building. What role did young people play in the resistance movements against the Nazi regime? This workshop will explore several examples of youth resistance and the impact these efforts made on the course of history. Who are the Rohingya and why have hundreds of thousands of Rohingya refugees been forced to flee Myanmar? What responsibility does the world have to end what the United Nations is calling “ethnic cleansing” and many are labeling as “genocide”? In this workshop we’ll explore the plight of the Rohingya and what we can do to help end these current atrocities. Was it a ghetto? Concentration Camp? Or center of Nazi propaganda? Learn about the lives of children who were imprisoned in Terezin and the art they created. In this small Czech town, the Nazi’s attempted to fool the International Red Cross, and the world. Throughout the Holocaust, Jews relied on their music to help them survive. Instruments were smuggled into ghettos and scores were composed on contraband paper. In this workshop we will explore the powerful relationship between song and resistance during the Holocaust and today. No musical experience necessary! During the Holocaust, millions of Jews fought back against Nazi oppression—spiritually, politically, and through the armed resistance of Jewish partisans and ghetto fighters. Explore the events that drove them to resist, learn how they fought back, and discover the continuing impact that all forms of resistance, including survivor testimonies and memoirs, have in today’s world. How can we give voice to those silenced by genocide and speak louder than those who would deny it? In 1915, the Turkish government killed 1,500,000 Armenians. In this workshop we will explore the history of the Armenian Genocide and together create a public awareness project. How did the Nazi Party manipulate laws in order to persecute Jews and other “undesirables”? We will construct a timeline of the Holocaust and analyze how the Nazis incrementally changed people’s perceptions of, and actions towards, those targeted and persecuted. “Never again'” has become more than a slogan first used by Elie Wiesel: It’s a prayer, a promise, a vow. This workshop will explore the connection between hostility, prejudice, and discrimination against Jews in the past and the present. What strategies might we employ when confronted with prejudice in our own lives? Discover the poetry that was written by Jews in ghetto cellars and in the forests by Jewish partisans where cultural activity constituted as form of defiance. In this workshops we’ll explore poetry written in secret during the Holocaust and relate it to the poetry of resistance we see today. Establishing and maintaining a healthy school climate requires intentional practices and constant attention to best practices. Join us for an interactive discussion and presentation of strategies to engage students, teachers, and parents in this work and learn how to make your school community No Place for Hate. What are our guiding principles and practices when teaching about the Holocaust? How do we determine our goals when confronted with this history? 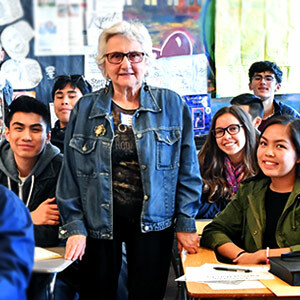 Together we will examine strategies and resources developed by Facing History and Ourselves that can help us navigate the history and legacy of the Holocaust with our students. Examine the history of the Armenian Genocide and how it became the archetype for other genocides of the last two centuries. Investigate why the particular history of the Armenian Genocide is important to teach, and what lessons can be applied to current human rights crises.